Agents with advertised or claimed listings on Trulia will now receive a free weekly digest email from the portal that gives them insight into how their listings, and those comparable to it, are performing on the site. 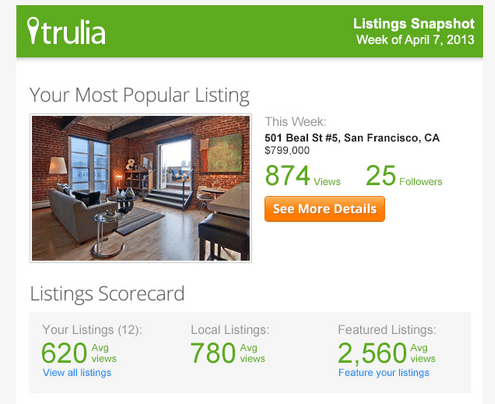 The email shows the number of views and followers of an agent’s most popular listing on Trulia received for the week covered along with a breakdown of the average view count of all of the agents’ Trulia listings. It also displays the average number of views of both those listings that agents pay to feature — to bring them to the top of the search results page in an area — on the site and those not featured, and highlights the number of views the four most popular listings in the city received in the week. When agents click on a “See More Details” link in the email, they’re taken to a listing reporting page on Trulia, which, in addition to showing the number of search result views and property detail page views for that week and how they’ve changed percentage-wise from the previous one, surfaces the top five most viewed listings of those consumers who have also clicked on an agent’s specific listing. Each listing an agent has on Trulia has a reporting details page that lists the comparable listings and displays the number of views each has received for the week covered, and notes whether they’re featured or not on the site and how much interest they generate determined by consumer engagement with the listings’ property detail pages, he said. “We tried to give agents a way to benchmark their listings against others in the market with this feature,” Holder said. With the insight from this tool, he said, agents can make a decision about whether to price a home differently, spruce up its photos or feature it on the site. Trulia claims that featured listings, which cost agents $19.99, $39.99 or $69.99 per month to feature one, up to three and up to 10 listings, respectively, generate more than four times the number of views on the site than unfeatured listings.